Information Contacts: P. Kyle, New Mexico Institute of Mining & Technology. Apparent ash plumes from Mt. Siple were detected by NOAA 10 satellite imagery (visible band, orbit 10406) on 18 September at 1301 and again on 4 October at 1534 (infrared and visible bands, orbit 10636). The 4 October plume extended ~160-170 km WNW and was well-defined, but it was uncertain whether the plume originated from the volcano's summit or base [but see 13:12]. A review of past LANDSAT images indicated a possible February 1988 ash deposit on the ice near the volcano. Michael Matson and George Stephens are currently applying additional satellite data aquisition and reduction techniques to refine these interpretations.
. . . Geologists hope to visit the volcano in November. Information Contacts: W. Gould, M. Matson, and G. Stephens, NOAA; W. LeMasurier, Univ of Colorado. Further analysis of satellite images by geologists strongly suggested that the plumes originated from the volcano's summit, rather than its base. 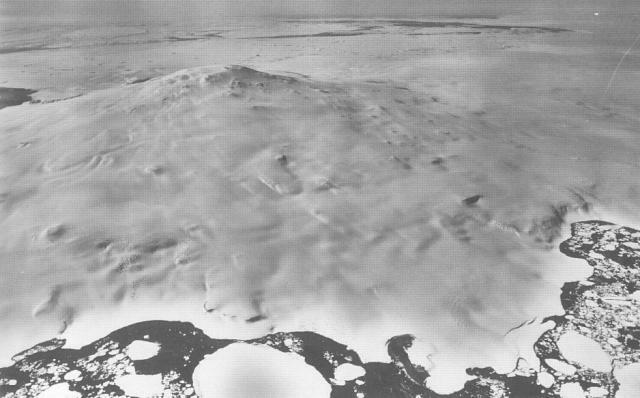 On 30 December, Philip Kyle and William McIntosh conducted an aerial inspection of the snow-covered volcano. The weather was clear except for low clouds below 500 m, around the mountain's base. No fresh ash, new craters, disruptions to the snowpack, or other evidence of recent explosive volcanism were observed. Although appearing identical to known eruption clouds, Kyle believes that the Mt. Siple plumes resulted from meteorological effects. Mount Siple is a youthful-looking shield volcano that forms an island along the Pacific Ocean coast of Antarctica's Marie Byrd Land. The massive 1,800 km3 volcano is truncated by a 4-5 km summit caldera and is ringed by tuff cones at sea level. Its lack of dissection in a coastal area more susceptible to erosion than inland volcanoes, and the existence of a satellite cone too young to date by the Potassium-Argon method, suggest a possible Holocene age (LeMasurier and Thomson 1990). Its location on published maps is 26 km NE of the actual location. A possible eruption cloud observed on satellite images on 18 September and 4 October 1988 was considered to result from atmospheric effects, after low-level aerial observations revealed no evidence of recent eruptions. The Global Volcanism Program is not aware of any Holocene eruptions from Siple. If this volcano has had large eruptions (VEI >= 4) prior to 10,000 years ago, information might be found on the Siple page in the LaMEVE (Large Magnitude Explosive Volcanic Eruptions) database, a part of the Volcano Global Risk Identification and Analysis Project (VOGRIPA). There is no Deformation History data available for Siple. There is no Emissions History data available for Siple. Mount Siple rises to 3110 m and forms the high point of Siple Island in Marie Byrd Land off the coast of Antarctica. This aerial view is from the west, with dark-colored open water in the foreground and pack-ice-filled Pankratz Bay at the far right. Mount Siple has the largest exposed volume of volcanoes in this part of Antarctica because it lies outside the continental ice sheet. The exposed rock surface along the coast to the right of center is the young satellitic tuff cone of Lovill Bluff. U. S. Navy photo TMA 1627 F33 088, 1985. The Global Volcanism Program has no maps available for Siple. There are no samples for Siple in the Smithsonian's NMNH Department of Mineral Sciences Rock and Ore collection. Large Eruptions of Siple Information about large Quaternary eruptions (VEI >= 4) is cataloged in the Large Magnitude Explosive Volcanic Eruptions (LaMEVE) database of the Volcano Global Risk Identification and Analysis Project (VOGRIPA).